I'm a huge fan of the Star Wars Expanded Universe. For those of you that don't know, the Expanded Universe is anything Star Wars outside of the movies. I've been reading novels in the Expanded Universe for as long as I can remember. Some of my young adult novels were Star Wars Expanded Universe when I was still learning how to read. The Expanded Universe that I know and love is now wiped out. They've officially made it non-cannon to make way for the new Star Wars movies and all of Disney's future creative endeavors now that they own the intellectual property. It was a major blow to me when I found out. I've been invested in this Expanded Universe for as long as I can remember. I didn't read a Star Wars book for almost a year after they made the announcement. A New Dawn was my first novel after my hiatus, and it's the first novel that is part of the "New Expanded Universe". They've said that this New Expanded Universe will always be canon. From this point forward, every novel, TV Show, comic, and videogame will stay canon to the Star Wars Universe. In a way, this is really cool. It makes it easy for people to start getting into the New Star Wars Expanded Universe. As of right now, there are two novels, three comic books, and two TV shows in the New Expanded Universe. You could probably get through all the material in a long weekend if you really dedicated yourself to it. So they've cleared the way and they're actually planning the New Expanded Universe for the long haul this time. But what about the Old Expanded Universe that I've been so invested in? Well, it's abandoned, and I'm still sad about that. But a side effect of scrapping it is... it's now complete. Nothing will ever be added to the Old Expanded Universe. If I wanted to, I could consume every piece of content in the Old Expanded Universe and say that I've completed it. That's kind of amazing. It's also a little too ambitious. But I am interested in doing a smaller version of that. 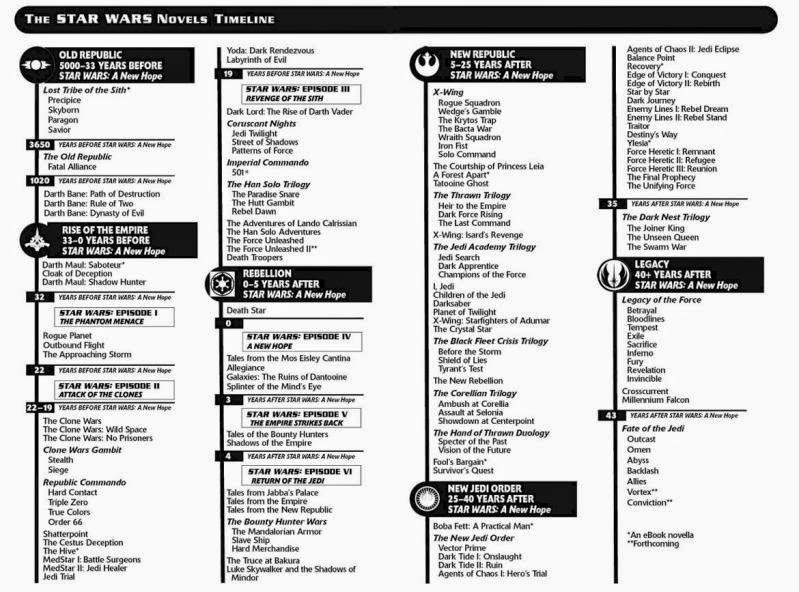 Right now I'm contemplating reading all the novels in chronological order that take place after Return of the Jedi. That's when the authors finally get freedom to introduce new characters and ideas. The series gets so interesting once it's freed from the movies and given free reign, especially once it reaches the New Jedi Order time period. It would be a lot of books, but I've actually read most of them already. I'm sure I've missed a few along the way, but for the most part it would be like visiting old friends. I'm not committing to it right now... but it's floating around in my head now. I might buckle down and start it soon. I'll definitely let you know. It's nice to have order, but I do like when these worlds take on more elements of ancient mythology and have a distinct flavor depending on your access point and your sources. They really start to go all out once they hit the next generation of people in the universe. Leia, Han, and Luke all have children. Their children are where the most interesting stories in the Expanded Universe are.